It seems like the release of CRM 2015 as sparked a fire for a lot of companies using CRM 2011. There are many differences between the CRM 2011 and CRM 2015 feature set, hundreds of new features were added for CRM 2013 and hundreds more for 2015. However, there has also been changes in long standing features on how it operated from both a user standpoint and data record perspective. One big change is in how the Lead Convert process works. In part of the process to reduce the windowing effect of using the product to make it simpler and tablet friendly, the entire Lead convert process has changed. Take a look at the different scenarios for both 2011 and 2015 below to get a peek on how you may need to incorporate this as a to-do list item in your upgrade process to 2015. 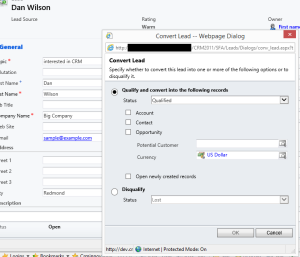 When you qualify a Lead in the current 2011 CRM a pop up appears and you are given a choice to convert the Lead into an Account, Contact and/or Opportunity. a. an Account is created from the info on the Lead. a. a Contact is created from the info on the Lead. b. An Opportunity is created with the chosen existing Account/Contact in the Account lookup field on the Opportunity. 1. When you qualify a Lead that has a First/Last Name and Company Name filled out a Contact, Account and Opportunity are created. 4. If you qualify a lead where the Company Name matches an Account already in the system a pop-up will appear with a duplicate warning and will allow you to lookup to an existing Account instead of creating a new one. A Contact & Opportunity will then be created as per #1 above. We are not using 2015 yet, but I hope there is a way just to turn a lead into a contact, not an opportunity. We frequently get “leads” that are people involved with an opportunity that exists, and have queried our web site, for instance. Just about everyone has the same issue. It sure would be nice if the action could be customized without hacking it. 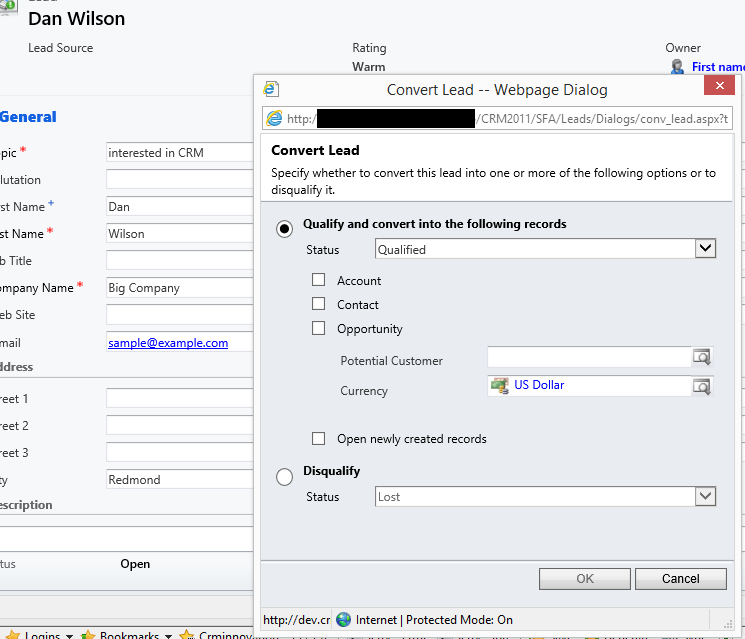 If it was me I would create an On Demand Workflow to convert the lead to the contact. It would take training to have the users by pass the convert lead button but it would be the simplest technology solution.